Srimati Radharani appeared on the eighth day of the waxing moon of Hrsikesha (Bhadra) mase, at noon. 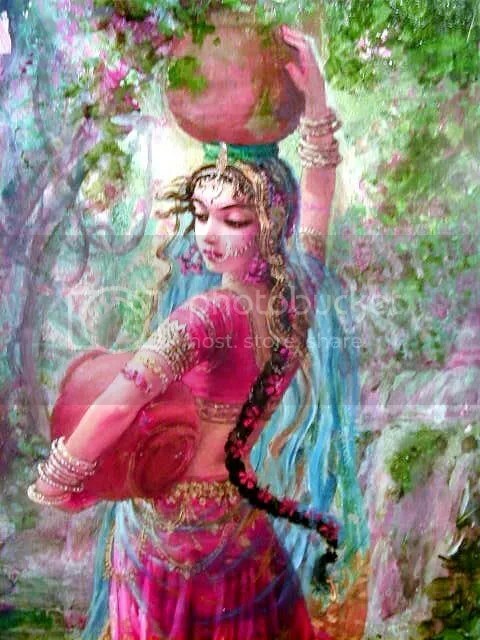 On Bhadra Sukla Saptami, Sridama, Radharani’s brother or Her mother Kirtida comes and picks Her from Yavat, Her mother in-law Jatila’s house and takes Her to Barshana where there is three day celebration for Her appearance day. Krsna comes from Nandgram and stays for three days to participate in the festival and of course Radha & Krsna enjoy unlimitedly Their ever-new pastimes in Their secret hideouts, even in very house of Vrishbhanu & Kirtida-devi. For those of you who have missed the celebration on Radhastami and anyone else, you are welcome to join us in Iskcon Klang, as we attempt to bring the the beautiful Vrindavan atmosphere with animals and greenery and flowers for the pleasure of Their Lordships. Come and join us as we celebrate the most glorious Radhastami for Sri Sri Sri Radha Krishna on the 14th September 2008. Click here to know more about Srimati Radharani.